Earlier tonight, a teeny-tiny image of the Wii Mini's box appeared online. Here's a better look at the console itself. And hot damn, it's lovely looking. Smaller than the regular console, the Wii Mini has a red casing and a rough, matte finish with a Wii logo dead in the middle. It appears to be a top-loading console, because there are two buttons (one is a power button) in the corners. However, the Wii Mini does not support WiFi or GameCube games. 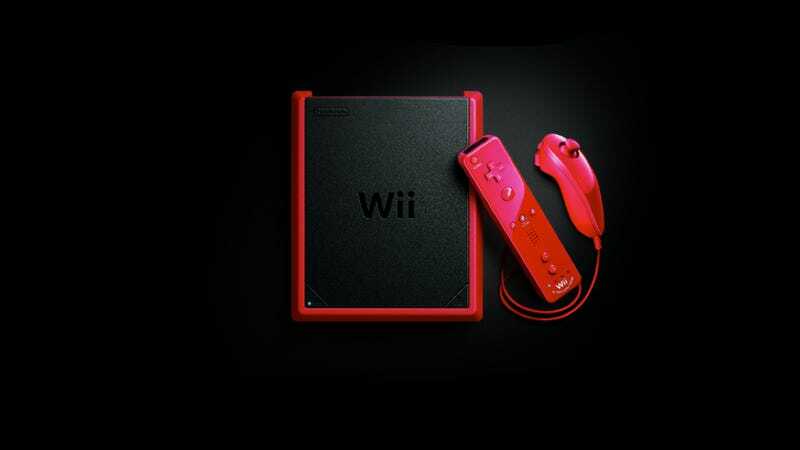 Priced at US$99.99 and out December 7, the Wii Mini also comes with a red Wii Remote Plus and a Nunchuk. Update: It's official. The console will launch in Canada on December 7 for $99.99. Here is a photo of what is in the box, courtesy of Nintendo.com.